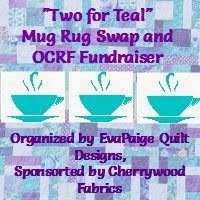 Last month I signed up to participate in the Mug rug swap organized by EvaPaige Quilt Designs to raise funds towards Ovarian Cancer. The swap involved using a teal colored hand-dyed piece of fabric sent by the organizer/ sponsor to make a mug rug for your partner. Then a few days ago along came a package in the mail that contained the teal focus fabric, my partner's mailing details and also a (very handy) list of her likes and preferences. I was glad to have this because it's so nice to make something for someone that they might actually like! So then - nautical theme? The color teal lends itself very well to that, hence, check. No pink, include green - that's in keeping with my own preferences too, no worries there. 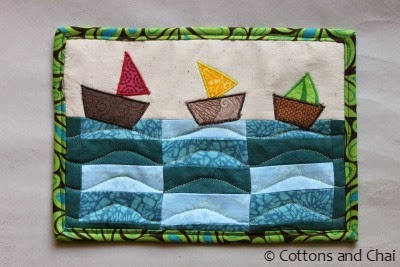 Traditional pattern - umm, slight hiccup there, as I'm really not a very traditional quilter. Well, two out of three ain't bad, eh? Next I decided on the the approx size of the mug rug. 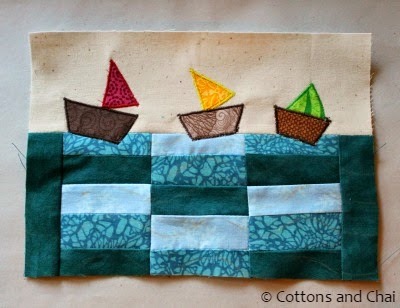 The top portion I thought should be a different fabric that would serve as a background for the boats, so I trimmed an inch and a half from the wave portion and also attached two teal strips to either side to increase the width. 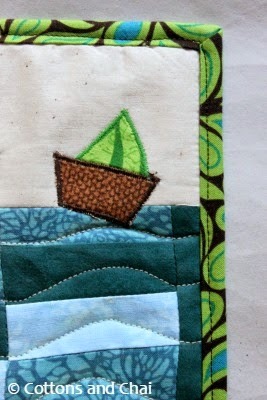 Next I added 3 inches to the wave portion by attaching a piece of off-white colored cotton. This is about as traditional as I could go! Anyone who's familiar with my work so far knows how much I love appliques. 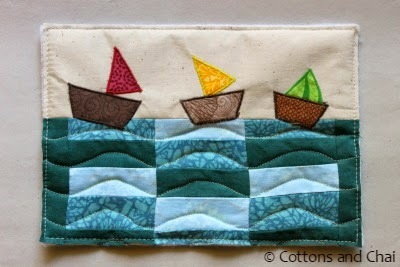 I decided to add a pop of color to the white and blue seascape by appliqueing three sailboats bobbing along the waves. 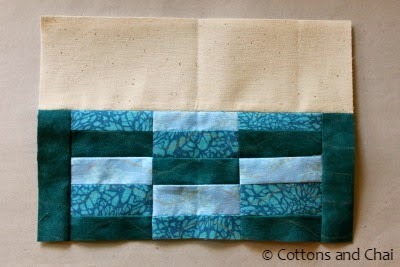 Next I cut a piece of backing from the lightest blue fabric and a piece of batting, made a sandwich and proceeded to quilt some waves. 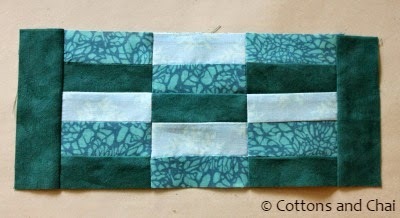 Also, I basted the three layers together along the edges. Now all that's left is to hope that my swap partner thinks it's a nice mug rug and not an ugh mug rug! But on a more serious note, I want to take a moment to think of all those women out there that are battling ovarian cancer (or any other sort for that matter) and pray for them to have hope, strength and resilience to bear the storms which lie ahead and that they come out of it well and healed. 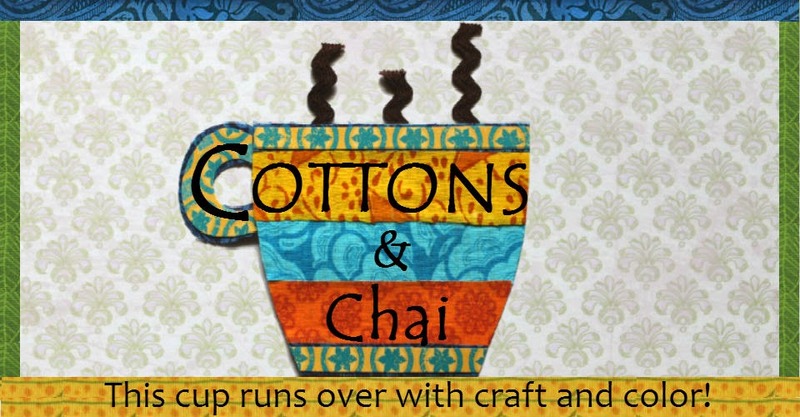 What an adorable mug rug! 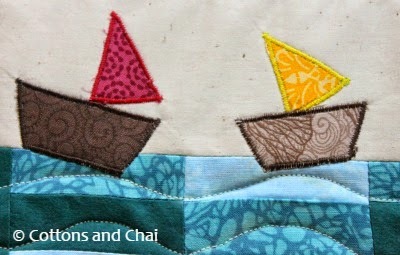 :-) I loved the placement of boats on the waves. Simple and beautiful! It came out so nicely in the end :) Simple and elegant. How did you make the wave pattern, is it free motion? Can I do it with a basic sewing machine? Hey Vidya, yes the wave pattern is totally free motion and done with quite a basic machine. 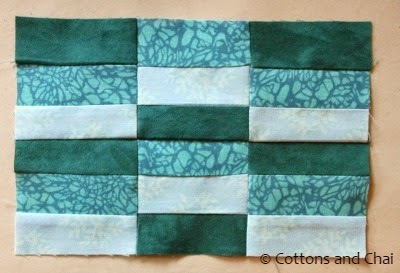 I marked the waves on the fabric first with tailor's chalk (if you notice, each wave crest is centered in every rectangular fabric piece, just to give it symmetry) and then I just went over the marked lines with a simple straight stitch - done.